My first job was at Baskin-Robbins ice cream store. 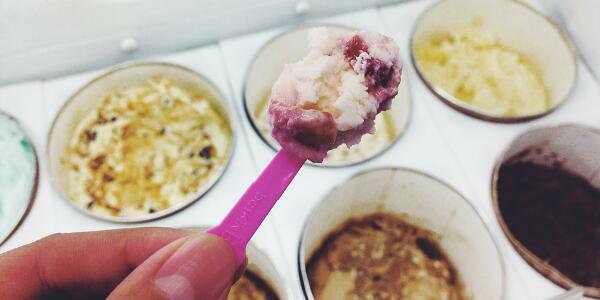 One of the best things they did was to have tiny, little pink spoons where you could try a flavor before committing to a whole scoop. Who doesn't like the idea of try it before you buy it? So, this post will contain the first chapter of my book Leave Him? That way you can get a taste of what the book will be like before you buy it- in Baskin-Robbins tradition. Leave Him? (available at Amazon.com in print for $12.99 and Kindle for $2.99) Also available for local purchase in print at at Willis Jewelry Company located at 203 Adamson Square in Carrollton, Georgia, the Therapeutic Lair at 723 E. College Street in Bowdon, Georgia, on the square in downtown Newnan, Georgia in Gillyweeds at 21 W. Court Street, and at the Wildwood Charm shop at 315 S. Hamilton Street in Dalton, Georgia. The warm blood oozed out of the wound and dripped onto the wooden slat floor forming a small puddle on the hand-made pine board cabin Harvey Pate had carved out from the Western Georgia woods ten years before in 1904. The sound of dripping and the shooting pain woke Ella Mae. Her head had just missed the rock hearth of the fireplace where a small fire still burned keeping warm a kettle of grits that hung in an iron pot over the flames. After opening her eyes for a moment, she closed them again tightly, hoping not to relive the images just before falling to the floor. Unfortunately, it would take more than closed eyes to make her forget. Ella Mae tried to tell Harvey that she had just returned from taking the kids to her parent’s house, but as so many times before, he started hitting her, first with his fists, then the chair. She had turned away to avoid his blows when the wood of the chair landed on the back of her head. This time it was a chair, last time it was a broom. And then there was the time she would never forget when it was a bullet from his pistol that pierced her shoulder. She dared not stir and let him know she was awake, fearing that there might be more blows, or if he were finished there would be the usual apologies, and he would beg her to forgive him—again. Then she heard it. A familiar voice was speaking. She strained to hear and then it got louder and very distinct. “Take your children and leave.” Over and over she heard the same words. Her head was pounding and the blood now dripped steadily onto her neck, soiling her dress. Ella Mae wondered if the bleeding would stop this time without the stitches from Doc Flanders. She walked to the bucket of water and dipped a rag into it and squeezed it out. Ella Mae had gotten quite skilled at fixing herself up after their confrontations. Even the soft wet cloth brought intense pain as she touched the wound. She put all the pressure she could stand on the spot and sat at the table hoping in her stillness the blood would clot. Leave him…how can I leave him? Just two Sundays ago, on meetin’ day, the preacher had said for them to bear their crosses in life bravely—that we all had our troubles to endure. Ella Mae could feel the preacher’s eyes boring into her as he said the words. Preacher Ellison knew about Harvey beating her. Ella had confided in him years before, asking him what she should do. The words of the preacher caused Ella much more pain than any blow her husband had given. The Man of God said that she had no choice but to live in fear and in pain until, just like he had said in their marriage ceremony, “Till death do you part.” Ella had resigned herself to the fact that it would be her death that eventually ended her pain. With every fit of rage she wondered if this one would be it. She took the damp rag off the wound on her head and patted it with another spot to see if it was still bleeding. It had slowed down, but the red blood stained the white cloth, encouraging her to hold it tight for a while longer. To her surprise, tears began to trickle down her face. It had been a while since she cried. There was a time when all she did was cry, then, one day it was as if she had spent her lot. There were no more tears left. What good did they do anyway? Never did change nothing. The answer was the same. Take your children and leave him. Ella Mae knew God’s voice and didn’t want to disobey Him. The blue bird sat on the limb in front of her. His fast-paced chirp seemed to be directed to her. Ella stood there fascinated at the brightness of his feathers. He was sitting on the limb right where Harvey Pate had told her to meet him. Was it a sign? The blue of the feathers were almost the same color as Harvey’s eyes. Those eyes. That was one of the problems she had with Harvey Pate. Those eyes were so blue and deep they seemed to invite her to stay and swim in them for a while. She tried not to stare at them instead she looked down. She knew if she ever fully stared into them without reservation she would lose her soul. The last time they met at this very spot, he had used those piercing blue eyes, dark hair and his boyish smile to urge her to marry him. Today she was to give him her answer. Why shouldn’t she follow him to the preacher’s house and be married? She knew Harvey loved her. She had no doubt about his love, but something within caused her to feel unsettled. Harvey came from a good family. Ella had talked with the Pates many times when she’d come over for Sunday dinner, and Harvey seemed like a good man, but there was something. The rock sailed past her and made a big splash in the river beyond her. The bird flew away at the sound of the noise. Harvey ran the rest of the way towards her then reached around her and pulled her to his chest. She took a deep breath and looked up into those eyes. For just a few seconds their gazes locked. Just as Ella had thought, she felt her soul transfer through the warm spring air that stood between them. Ella felt her head nod, violating her conscience, and before she knew it she was riding with him to the preacher’s house. Standing there before the preacher holding Harvey’s hand, she tried to silence the voice within that was telling her to stop. Why shouldn’t she marry him? Her reasoning convinced her that he loved her, and evidently she loved him. The two of them should be together, shouldn’t they? Why had she not insisted on waiting until her parents could be there? Maybe her father could marry them like he married many of the area people underneath his big tree. Ella knew that her father would ask her questions. Questions she didn’t want to answer. Questions like, “Have you prayed and asked God if he is the one for you?” or maybe, “Do you have complete peace about this, Ella Mae?” She knew that she couldn’t answer either one of those questions with an honest yes, so they stood before the preacher after sneaking off to get married. His words startled her as his preacher’s voice boomed, “Do you take this man to be your lawfully wedded husband through sickness and health, til death do you part?” The preacher waited for her answer and looked more than a little impatient as she thought about it. Part of her wanted to run away as fast as she could, but Harvey’s eyes and tight grip on her hands told her she had gone too far to say no. She shoved the picture into the sack. The only thing she really wanted was to get away before he got home and tried to stop her. She opened her chest first and shoved her two other dresses in and laid her dress hat on the bed. In the children’s room she opened the drawers and crammed in as much as she could, with the last thing being a little dress that her daughter Sybil had worn when she was a baby. Poor Sybil. Just touching the fabric caused Ella Mae to feel the hurt that never seemed to go away. Her oldest child, her beautiful little girl, had taken ill two years before, and at the age of eight went home to be with the Lord. Ella Mae could still vividly see the little wooden casket being lowered into the ground in the church cemetery. On cold nights Ella Mae always felt the urge to cover up her little girl, wishing she could keep her warm. Things had gotten worse with Harvey after Sybil died. The cloud of depression they all were under intensified Harvey’s moods, and his moods always left Ella Mae bruised and bleeding. At last she felt as if she had all she could carry in the sack. She took the blood-stained rag and went to the mirror to wipe the dried blood from her face and hair. Quickly, she dabbed away the stains and brought some of her curly brown hair down over one of her bruises. She placed the hat on her head and pinned it in place, catching a real glimpse of herself for the first time in a long while. She tilted her chin up, noticed that her face looked thinner, older. Ella Mae tried to avoid mirrors. The mirror always made her think, ‘This is all my fault. I should have never married this man when I knew better. There is the person to blame staring back at me’. Today was different. Today as she looked into the mirror, into the eyes filled with hurt and shame, she saw a woman who had found the courage to leave. She saw a woman who would have to face the scorn of Preacher Ellison and all his loyal deacons of the church, her neighbors, and even some disappointed family members. Today she saw a woman who was listening and obeying the voice of God even when many others would say otherwise. She adjusted the brim of her hat once more, turned and looked around the room one last time. Sack in hand, she walked out the door, slamming it, leaving the past behind, walking boldly toward her future. Ella Mae was going to follow the voice. The wind blew against her, but with dogged determination Ella Mae walked toward the home of her youth, toward a life without fear. Her father was at the edge of their property mending a fence as she walked toward him. She saw the familiar, but older, more wrinkled face tense up a little more as he squinted in the sun and saw her coming. He reached up and removed his straw hat and wiped the sweat from his brow with his handkerchief. As Ella Mae got closer she could see that he was looking at her big sack of things and the bruises on her face. She looked down in shame as she reached him. She finally looked up. She could see that he was clinching his teeth together and his eyes were narrowed. She took a deep breath. Ella walked alongside her father. Matching his stride reminded her of a far simpler time, a time before Harvey Pate, a time before she had been hit. The sun felt warm on her face as she walked beside him. If only she could forget. Ella Mae reached up and touched the fresh bruise. It still hurt to touch it, but she knew that there had been plenty of worse times and really all Doc Flanders would do is tell her that it would heal with time if she didn’t need stitches. It was three weeks since she left Harvey. She sat shivering in the dark bedroom with her children hovering all around her, looking at her with fear in their eyes. Ella Mae was sure that her eyes reflected that same terror. There was no way to hide the feelings that Harvey’s threatening voice evoked in her. Ella could see through the edge of the window the two of them facing off. She then heard Harvey say, “Ella Mae, I know you can hear me. I won’t see you with another man. If it kills us both, you won’t be in another man’s arms.” He adjusted his hat and went out into the night. Ella Mae had tears flowing down her face. Her mother came into the room and took the children away giving Ella Mae a moment to herself. Her tears turned to sobs as she thought back to the words Harvey had said. She knew that he meant what he said. He would never see her in another man’s arms, besides, what man would want to cross Harvey Pate and touch his wife? At the age of twenty-eight had she forever lost the feeling of a man’s arms wrapping around her? Would she never again have someone to hold her tight? Should she just go back to Harvey? Maybe he would change. She knew that wasn’t true, but it would be easier to just go back. It would stop the voices. The women of the church had been talking. It seemed Harvey had told them that the reason he got into it with her was because she was unfaithful. Some of the women got to wondering about their husbands so badly that two of them asked Ella Mae if she had been with them. Then there was the preacher. Ella thought back to his last weekly visit.